A super Family friendly gift! 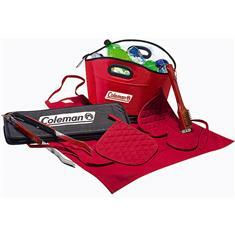 Our BBQ gift set is available in 5 material colors. The set includes a spatula, fork, tongs, grill brush, 12 pack party cooler for cans and ice, apron, pot holder and an oven mitt. Everything the weekend BBQ Gourmet needs! Great for Tailgating, Cookoffs and more. Imprint Area: (cooler) 10" x 3", (BBQ case) 5-1/2" x 4"